Aloha Niner Fans! 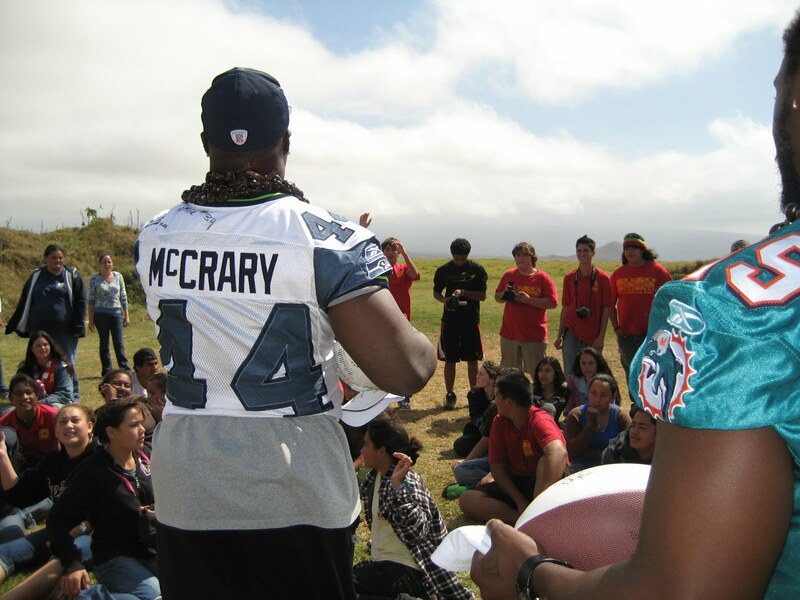 Well, today is my first day in Hawaii for the NFL Pro Bowl Youth Clinics and it is also my first time to Hawaii. Ever since I arrived, I have been greeted with amazing Hawaiian hospitality. The NFL Pro Bowl Youth Clinic program was designed to inspire kids to believe in themselves and their abilities. A group of several cheerleaders and players from around the NFL will be touring several of the Hawaiian islands over the next week. We flew into Honolulu yesterday and went to Kona today (very early!) for a day of school visits and youth clinics. I soon realized that not only did the setting of Hawaii leave me speechless but our very first school visit was unforgettable. We visited a cultural school where they learn and embrace the cultural traditions of Hawaii. When we entered the school they greeted us with a song and welcomed us. Then, we each spoke about the challenges that we overcame to bring us to where we are today. At the end of the visit, the students did a formal “mahalo” (or thank you) chant and presented us with gifts. As soon as we left the school, we were on our way to another school to teach youth clinics. To begin the clinics, we introduced ourselves (I received my first Hawaiian flower lei!) and began teaching them several dances and cheers. This was my first clinic but the girls were great listeners and learned the material so quickly. After teaching them a few cheers and signing autographs it was time to leave…but my day wasn’t over yet! We quickly left the school and headed to the airport to fly to Kauai, one of the most beautiful of the Hawaiian islands. Tomorrow will be another early morning with a school visit to a high school in Kauai. Thank you for joining me on my trip and I can’t wait to tell you more!